A Magical Event for Cat Lovers! 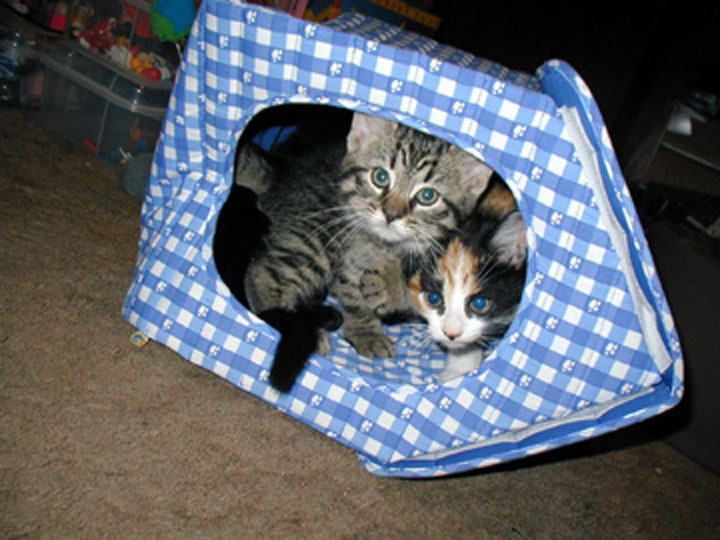 Kitty Amour, Inc., provides this free service for clients who are interested in expanding their feline family and for those who need help for cats and kittens in need of a great kitty home. We have networked with other pet care professionals and want nothing more than placing suitable felines in loving environments. So, if you are a current client of Kitty Amour, Inc., and find yourself in need of finding homes for rescued kittens or you want an additional cat in your life, please check here often and contact us with any requests. As a special "thank you," for adoptions that are successfully completed, the adopters will receive a FREE fun gift for their new cat, courtesy of Kitty Amour, Inc. Extremely Sweet and Loves Pets!!! A Beautiful, Sweet Boy Who Loves Other Cats! Elvis had been living with two other cats whose company he loved. However, several months ago they moved in with a dog and although the other two cats adapted to this new situation, Elvis is terrified of the dog and not having a good life. 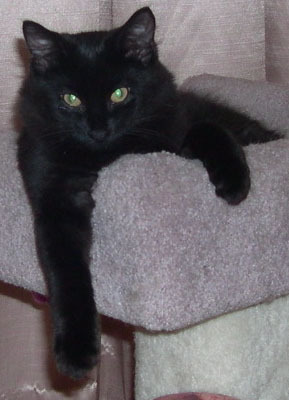 Unfortunately, Elvis needs to find a home with other cats or with no other pets. 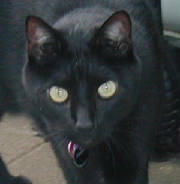 I have sat for Elvis many times and can attest to his loving demeanor and rewarding interactions we have shared! Please contact me for specifics! Elvis has been tested for FeLV and FIV, and is negative for both. In this picture, he is pictured on his fenced-in patio but was not a true outdoor cat, as he was always supervised during his Sun and Catnip Patch Outings. One beautiful, affectionate, very friendly, male Siamese and one very pretty, laid back, adjusted female Siamese are immediately available for adoption. Both lived in a multiple-cat household whose owner recently passed away. All the other feline members of the family have been placed into their new homes. These two WONDERFUL cats are currently being cared for at Home Vet Service in Belford. Please contact us for any further information regarding them!! These Beautiful, Healthy Boys Need Forever Homes! Tiki and Oliver are both rescues. 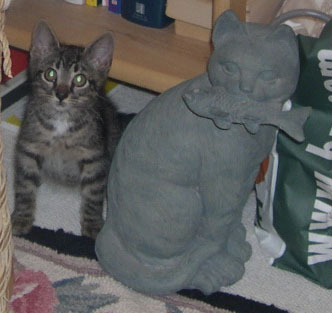 Tiki is short for Tiny Kitten. 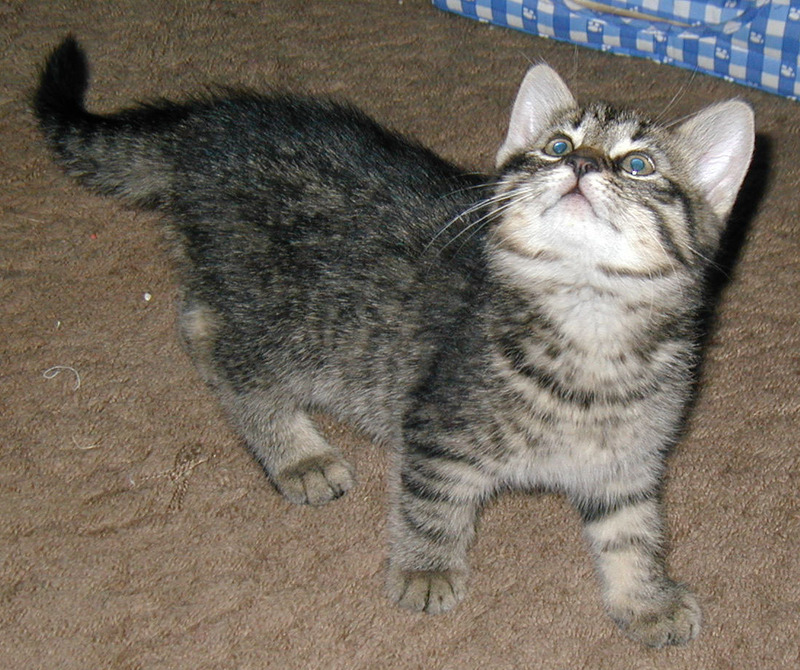 He has absolutely beautiful gray tabby markings, very defined. 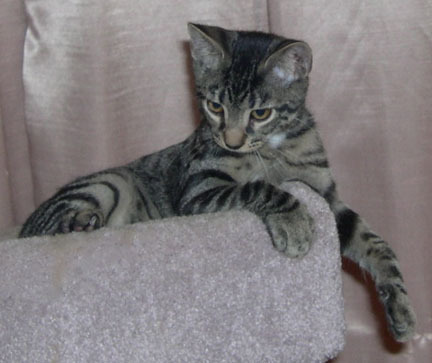 He is presently 3-1/2 months old, thin and tall and very, very sweet. For a little guy, he has a great big purr, loves to be petted and play and is full of the kind of kitten energy I wish I could bottle and sell. Tiki has been tested for FeLV and FIV, and is negative for both. He has been wormed and received his first two series of kitten vaccinations. Like many kittens, he is nervous around strangers but should have no problem adjusting to a new home after a few days of petting, playing and Fancy Feast. Oliver is a long-haired boy. Picking him up is like holding a ball of angora. He looks pure black, but also has tan coloring. He is amazingly affectionate! He gives kitty kisses, bats your face and loves to cuddle between ear and shoulder. Touch him and he purrs like a motor boat. 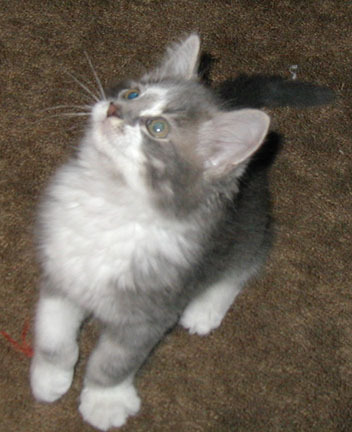 He is a typical running, hopping, jumping, playing kitten. I am unsure of age, but believe he is around 4 months. Oliver has been tested for FeLV and FIV, and is negative for both. He has been wormed and received his first two series of kitten vaccinations. Oliver also gets nervous around strangers, but with a little patience, he will be cuddling in a few days (or minutes?). Oliver needs a loving home - maybe with Tiki? These sweet, loving boys need a forever, indoor only home! They have been together all their little lives, but can be separated. Two brown tabby male kittens (loving brothers - very sweet!) are ready for adoption from Home Vet Service. 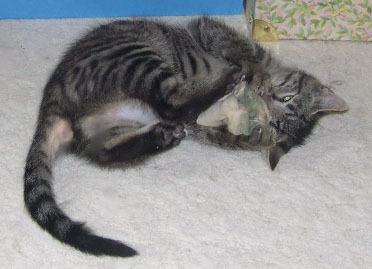 Beautiful, sassy grey tabby with white male kitten needs a home, too - also at Home Vet Service office. All have been tested negative, received vaccinations, and are approximately 10 weeks. Barney, PingPong,and Patches are littermates whose mother, Kitsie, was a stray cat one of our clients found, cared for, and adopted over the winter. Kitsie is friendly and when they decided to keep her as their pet and brought her to the vet, that is when they found out she was pregnant! They are such great people and have raised *the sweetest* kittens and provided all with lots of loving care! 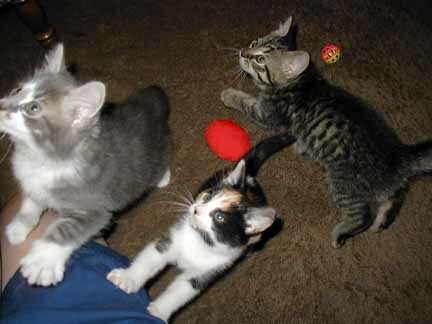 Barney, PingPong, Melissa, & Patches have been adopted through the Kitty Amour service!!! Two other kittens have also found new homes. 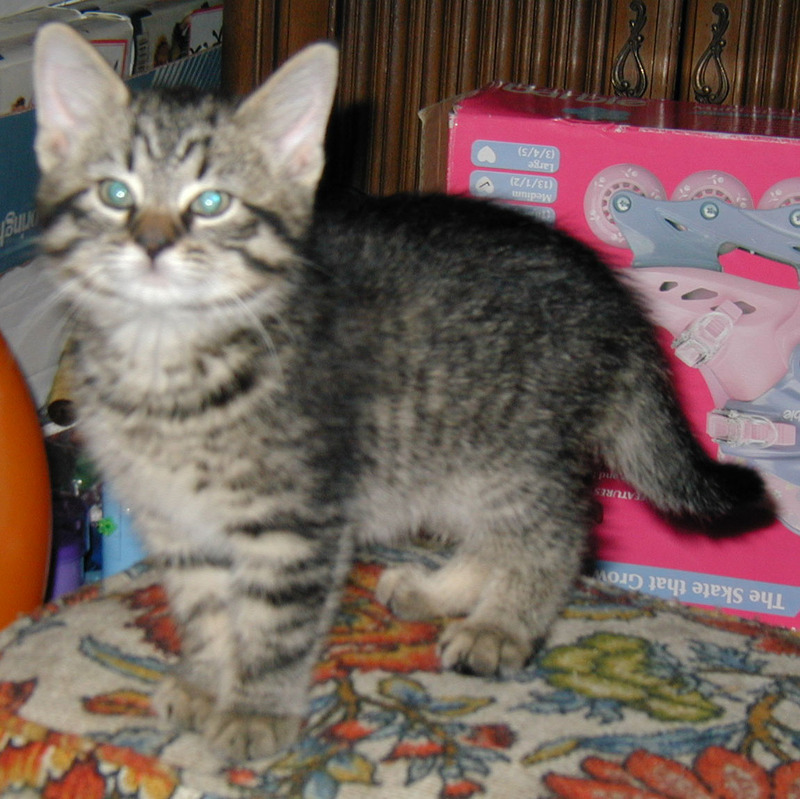 As a current Kitty Amour client, please contact me for information regarding other adoptable kittens. 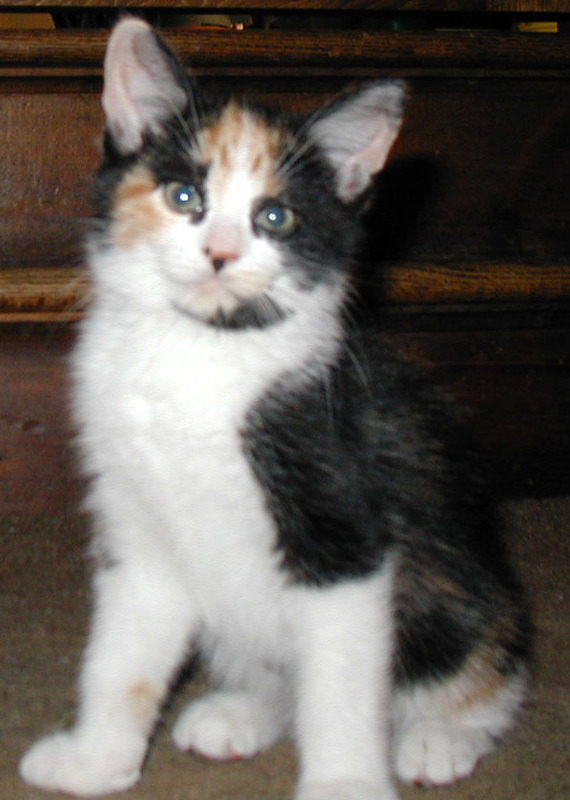 Patches is a littermate of Barney (above) and is a pretty female calico. She is bright and playful she loves to play kitten-tag! She will go onto her hind legs to be picked up if you hold your two hands out to her and say, "Patches, where's my girl?" She is so precious. She is very busy!!! 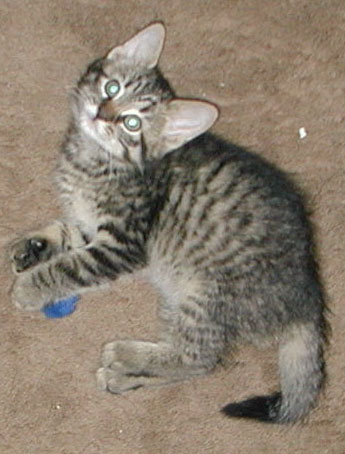 She loves to play, have physical contact, and "hunt" with toys. 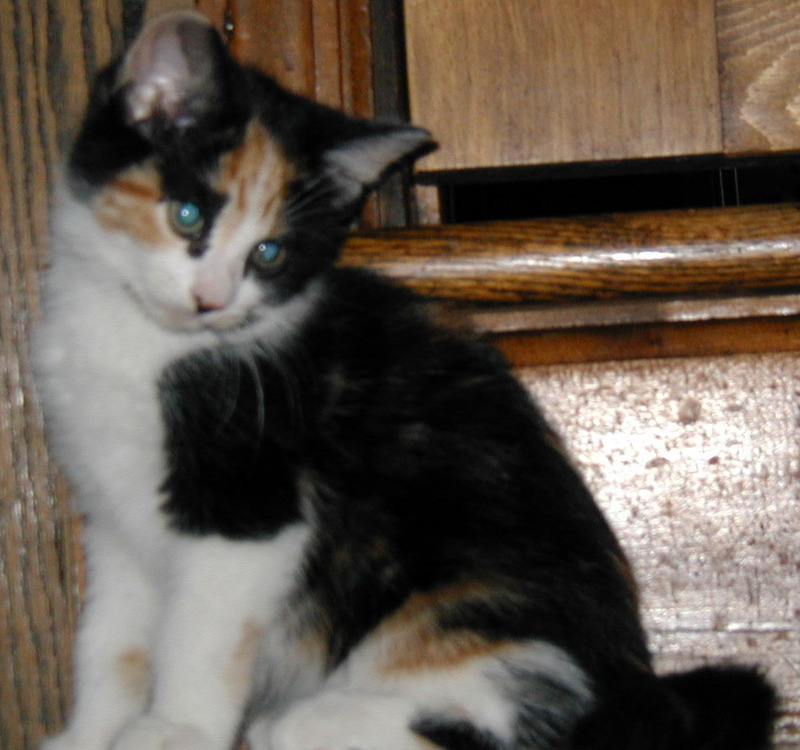 She has beautiful calico markings and is also a big purr! She will be an entertaining addition to a loving home. 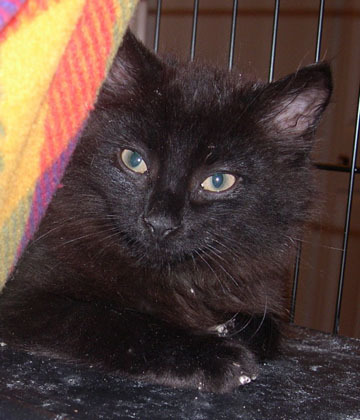 She has been raised in a very caring environment and her current caregivers want the purrfect home for her placement! Patches and her littermates are very healthy, have been raised in a very loving and clean environment - no fleas, no ear mites, have been treated for worms (but did not have them), vaccinated, and have tested negative for FIV. But sadly, if we cannot find someone to take Patches, she will be put into a shelter by the end of August. PingPong is a domestic longhair, mostly grey with touches of white. He is an adorable kitten and will be a beautiful cat. He is the largest of his littermates and although he is "in charge," is really just a gentle giant. He is already a lap-cat and loves to lounge upside down while being brushed. He and Barney are very lucky to have been adopted out together and will be littermates-for-life! Thank you to my special client, Gracie, for being so caring, loving, and generous to them. Copyright © 2002 Kitty Amour, Inc. All rights reserved. This is a copyrighted site. No portions of this site may be used or reproduced in any way or by any means.